I’m a big fan of ESEE knives. They tend to be strong, well made, and designed to last. On top of that their knives tend to be very affordable and very simply made. Their target audience is often the outdoorsman, the hunter, the prepper, and general adventurer. The Expat line is a specialty line of knives designed outside of the typical ESEE crew. I’ve previously reviewed the Expat Cleaver and I was a big fan. The second Expat blade is the Libertariat, which is a compact machete designed for a few different purposes. This is a blade that is lightweight, easy to use, and can be used for a variety of purpose outside of hacking down a path. The ESEE Libertariat has a 9-inch blade and an overall length of 14 inches. The blade is two inches wide and .12 inches thick. The handle is 5 inches long and 1.125 inches thick and made from wood. The Libertariat ways 13.08 ounces and comes with a canvas sheath. It’s a very small, but also a very lightweight knife. The Libertariat doesn’t have a lot of weight to it, but it can still handle underbrush, vines, and limbs. I’ve even cut down some small trees without issue. The Liberariat lacks a point and is cleaver like. The lack of a point has never been an issue in my use of this tool. The blade is made from SAE 1075 steel. 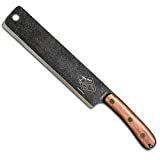 It can get very sharp and is a good hard and tough steel. It can take a real beating when used as a machete is intended to be used. Of course, it doesn’t hold that edge for a long period. I find myself touching it up before any kind of daily use or yard work. The blade has a Condor classic finish. This is a hammered finish that gives it the appearance of a tool built a long time ago. While it’s stylish its also effective, I rarely apply oil even though I live on the coast, and have yet to see rust. As I mentioned this small machete is designed more or less as a bush tool more than a yard working machete. It can serve as a machete, as well as a general survival knife. It’s small and handy and could be used to clean game in a pinch. The spine is a flat 90-degree surface that makes it easy to strike a ferrous rod with. The flat surface also makes it easy to baton wood into pieces if needed. I ‘ve batoned several pieces of pine wood without a problem. The hole at the tip of the blade allows the insertion of a rod to make what is basically a draw knife from this mini machete. The Little Libertariat can do it all, or at least try to. Most importantly it’s an impressive machete. It chops and slices without issue and chew through some seriously thick material. As a small blade with little heft, you really have to know how to work a machete. Even an expert is going to expend more energy using the short and light Libertariat than a standard machete though. With such a small blade you are using more energy, and losing reach causing you to bend over a bit to reach ground level. That’s the price to pay for a smaller, lighter, and handier machete. The handle is made from wood and very smooth. In over a year’s worth of use I’ve never felt it slip from my hands, but I would see why some would want some form of checkering. I also haven’t developed hot spots when using the Libertariat heavily. However, I did notice after one long day my hand got quite tired of handling it. The small handle requires a tight hold and that will cause fatigue to set in quicker than a full, thick, hand-conforming handle. The angle of the handle is perfect for machete work. It tilts the blade slightly forward and gives you an angle that maximizes your swing. This makes your swing more natural when you use a proper technique or flicking the wrist prior to contact you’ll use less energy and cut deeper. The sheath is very simple and made from a khaki colored canvas. It feels quite strong and very durable. Four metal snaps run along the seam of the sheath and hold it all together should the stitching rip or fail, or become cut all to hell from inserting and removing the machete over and over. There seem to be two styles on the market. One that leaves most of the handle exposed and then mine which covers a good portion of the handle. With mine the sheath covers the majority of the handle and drawing the Libertariat is not a fast endeavor. I have to pinch, pull, then grip the handle properly. I see why some of the newer models come with a sheath that allows a full grip. A small thong secures around the handle and keeps the machete in the sheath. It attaches the belt through a loop and that is really all she wrote. It’s simple, but it works. The Libertariat can do everything a bigger machete can do… with a lot more effort anyway. Its small size makes it easy to use for a variety of tasks outside of just hacking and slashing brush. It’s very light and would be a great camp tool, or for a hiker looking to cut pounds. For the price, it is hard to go wrong. Plus ESEE backs it with their lifetime, no questions asked warranty. The Libertariat is a potent little tool that will serve you well for a long time. 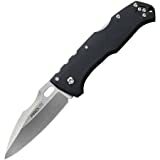 I recommend purchasing the ESEE Expat Libertariat at Amazon or BladeHQ. Please consider that by purchasing things through any of the links on this website you support BladeReviews.com, and help produce future reviews. Thank you very much.